Even though his offer of a referendum reflects constitutional reality, Sarkozy's position further unnerves EU. French President Nicolas Sarkozy was making a virtue out of a necessity when he announced that if needs be, he would hold a referendum on the European Financial Stability treaty. This was seen as the ultimate betrayal of Angela Merkel when even Sarkozy, her former doughty ally in steering the stability pact through the EU, was preparing to abandon ship. This has been viewed as a cynical attempt by a desperate Sarkozy to appeal to the anti-austerity and anti-EU voters that he needs to win over - if he is to have any chance against Francois Hollande. 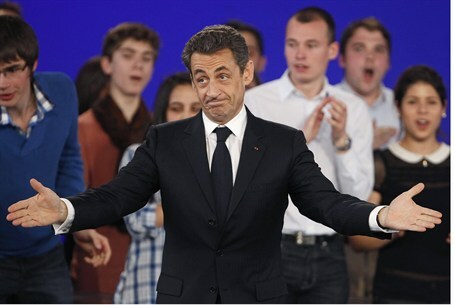 One of Sarkozy's problems has been his inconsistency and his tendency to switch positions. For example, in 2007 he campaigned as a person who wanted to emulate the New Labour of Britain. He then veered to be a devotee of German style economics. In this case, he has little choice. To get the stability pact through, he needs the Socialists who currently control the Senate and will continue to control it for a number of years, regardless of what happens in the presidential or National Assembly vote. If he had the votes for a constitutional amendment, he would have pushed it through before the elections. The Socialists have adopted a position that there will be no stability pact unless there is renegotiation to insert pro-growth clauses into the pact, that would radically alter it. Therefore, the only way that Sarkozy could overcome this opposition is to go over the heads of the legislature and appeal to the French voters directly, via a referendum. The referendum was a feature of the 5th Republic installed by General de Gaulle, who had vast contempt for the legislative branch and wanted to neuter it totally; one of the devices to achieve this end was the referendum. Here again Sarkozy is displaying inconsistency. France in 2005 voted against the so-called European Constitutition, which was then passed by the legislature as part of the Lisbon Accords - without giving the French voter a say on what was essentially the same thing that they had rejected. Referenda are not popular in the EU. First of all, they can produce the wrong result and therefore both the political and bureaucratic leadership distrusts public opinion. The legislatures have been more reliable in approving pro-EU legislation, as the major parties have a tradition of supporting the European Union. The opposition within the major parties is compelled by party discipline to go along while the anti-EU legislators on the right and the left find it difficult to make common cause and a legislative vote. When they come to a ballot box in the referendum, they can all put their no votes into the same pot and no one will be the wiser. Once France goes the referendum route, it increases pressure in other countries to give their voters the same option and given the ugly mood in Europe, prospects are good that the pact will fail in at least some of the electoral hurdles.